How negotiable is a fact in nonfiction? In 2003, an essay by John DâAgata was rejected by the magazine that commissioned it due to factual inaccuracies. 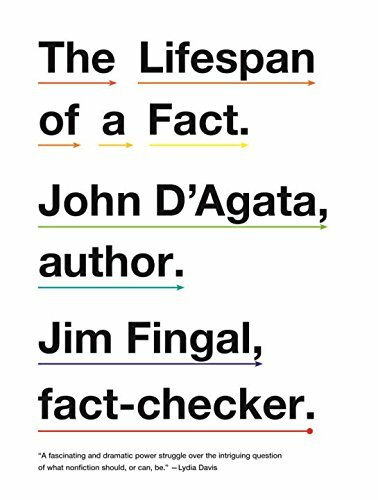 That essayâwhich eventually became the foundation of DâAgataâs critically acclaimed About a Mountainâwas accepted by another magazine, The Believer, but not before they handed it to their own fact-checker, Jim Fingal. What resulted from that assignment was seven years of arguments, negotiations, and revisions as DâAgata and Fingal struggled to navigate the boundaries of literary nonfiction. This book reproduces DâAgataâs essay, along with DâAgata and Fingalâs extensive correspondence. What emerges is a brilliant and eye-opening meditation on the relationship between âtruthâ and âaccuracyâ and a penetrating conversation about whether it is appropriate for a writer to substitute one for the other. About: Named a top 10 Best Book of 2012 by Slate. With John D\'Agata, Donald J. Richgels, Lea M. McGee | 2nd edition from Allyn & Bacon (May 1, 1995); titled "Literacy''s Beginnings: Supporting Young Readers and Writers"
About: The Fifth Edition of Literacy's Beginnings offers an integrated approach to reading and writing instruction keyed to the five typical developmental stages through which most children pass (the IRA/NAEYC phases ofÂ literacy).